However, the font is the same size as the rest of the screen, which makes it pretty useless. It seems to be the same in iTerm. The standalone Emacs.app works, but I'd rather not use it. Is there a mac terminal which supports multiple fonts? I don't think it'll be possible - terminal-based applications (as those running in terminal emulators like Terminal.app, iTerm.app, etc are) don't support multiple concurrent fonts. This is because a terminal application is written to run on a traditional dumb terminal which wouldn't have the concept of multiple fonts. Within a terminal emulator, all text is displayed in the same font and this is why the sidebar doesn't look as it should. The only solution is to use a version of Emacs running under either Cocoa/Carbon (eg, Emacs.app or Aquamacs) or X11. Not the answer you're looking for? Browse other questions tagged mac terminal font emacs . 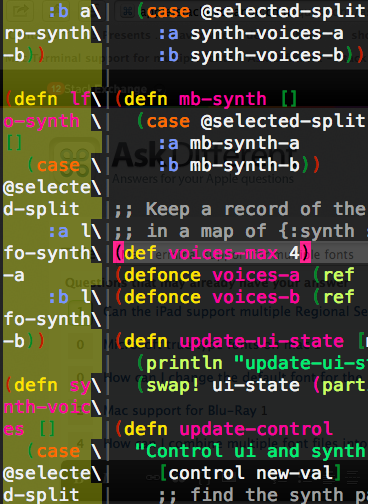 How can I match the text color and background color in Terminal?